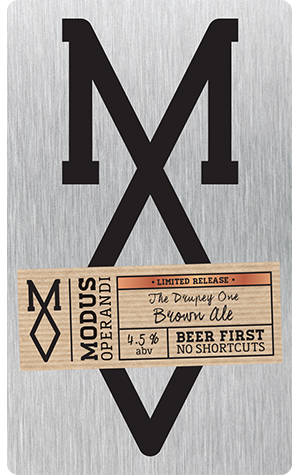 The first new beer for Modus Operandi in 2016 is a bonafide autumn seasonal release, although not one directly inspired by the Australian version of autumn. Rather, its roots lie in the fall of the northern hemisphere which marks the onset of the pecan nut harvest. MO brewer Dennis, an American whom we can trust for such tidbits, says pecans are synonymous with autumn in the states and that the pecan is the only nut native to the USA; it was purportedly a major autumnal food source for Native Americans, who may have also used it as the base for a cosmic beverage called ‘Powcohicora’ that sounds more interesting than the pecan pie that's become part of modern tradition. He also says the pecan is not technically a nut, but a ‘drupe’, a fruit whose outer flesh surrounds a shell with a seed inside, akin to peaches, plums or cherries. Hence the technically sound name for this beer, The Drupey One, which is an American brown ale that’s been aged on toasted pecans. This new beer seems something of a companion piece to 2015’s The Dopey One, a lovely brown ale brewed in collaboration with the Royal Albert Hotel that featured toasted coconut as its infusion. And, as with that beer, The Drupey One seems perfectly appropriate for the time of year, being something ever so slightly warming to hold on to as you cling to the ever-dwindling daylight hours and await a cooler change.